Acne can appear on any part of your body. Mostly it is found on the face and here the chin is the place where it is most difficult to treat and get rid of. Many people suffer from acne on chin, which show no sign of going away. They are painful in some cases and they appear in no time. They seem to get double overnight and trouble you. Hormones are believed to be the major cause of acne. Although acne on the chin is stubborn, there are some methods by which you can reduce acne on the chin and finally succeed in removing them. Hormonal changes are most affected by your chin and the jaw line. They quickly respond to changes in hormone levels. So this part of the face is most prone to acne breakouts. Most of you must have seen that although the rest of your face is clear, the chin and the jaw line show acne breakout. However, there are some measures to treat this acne and remove them. Acne on the chin and jaw line is often termed as the beard of acne. When hormonal changes take place, the oil glands start secreting more sebum. This is found particularly in teenage girls and young women. The sebum thus produced clogs the pores and this leads to the growth of bacteria. As a result acne starts to appear. If you are suffering from zits on your chin and jaw line and want to reduce them, here are some tips on how to reduce them. Incorporate them in your regular skin care regime and soon you will be able to get rid of them. Make it a point to wash your face every morning after you get up and at night before you go to sleep. However, do not wash your face too often. This leads to the loss of natural oils from your skin and as a result the sebaceous glands become hyper active, producing more sebum. So washing your face twice a day is enough. But if your face gets dirty in the meantime or if you visit a gym and sweat a lot, you can wash your face more than twice a day. Using a non-alcoholic soap to wash your chin is the best for your skin. Apply the soap o your face in gentle massaging motion and then wash your face with lukewarm water. Then you have to pat dry your face with a clean and soft towel. Oily hair can also cause the formation of acne on your chin and jaw line. If you have an oily hair and you touch your hair with your hands, your hands get oily. When you touch your chin with this oily hand, the oil from the hand gets transferred to your chin, making it oily. This leads to clogging of pore and breakout of acne. So, if your hair is oily, make it a routine to awash your hair with a mild shampoo, which is specially made for oily hair. If your hair is long, tie your hair and make sure that your hair does not come into contact with your chin. This way you can avoid the appearance of acne on your chin. Many girls and women use makeup which can mask the acne on the chin. You can also use makeup to hide acne but make sure that the makeup you use is non-comedogenic and non-acnegenic. Powder based makeup is better for your skin than makeup that are oil based or cream based. This is because powder based makeup reduces clogging of pores and acne breakouts. Always remember to remove all your makeup before you go to bed at night. When you remove makeup, you have to pay special attention to your chin. This way the pores on the chin are prevented from getting clogged with the makeup residues, oil and dirt. Make it a practice to apply an acne cleansing product on your face. Take care to apply it particularly on the chin. The product that you use must contain salicylic acid or benzoyl peroxide. This will prevent formation of acne on the chin and jaw line by regenerating new skin cells and preventing clogging of pores. The best way is to use two products, one containing salicylic acid and the other containing benzoyl peroxide. The effect you get by combining these two products is much better than that you get by using only a single product. One important thing to remember is never to scratch your zits. 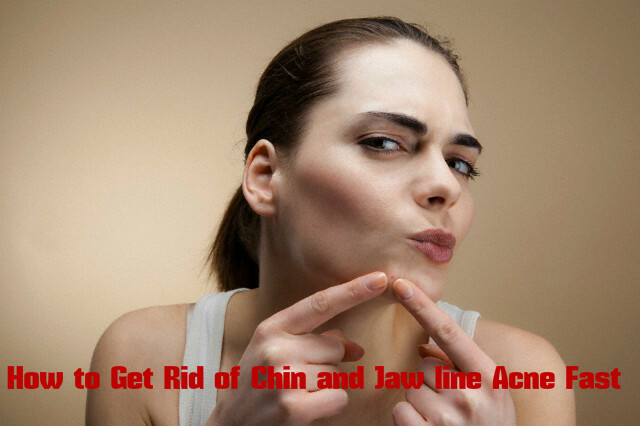 This can make things worse and even lead to infection of the chin area. If the acne gets infected, there is high chance of scarring. This make your chin area look scarred and unpleasant to look at. After trying the above mentioned tips and still you see no improvement on your chin and the jaw line, then you may visit a dermatologist and take his advice. You may have to take oral medicines. This is only a temporary relief and it does not help you to banish acne forever. You can just reduce the breakout of acne and get some relief. Instead of taking only antibiotics, you may also apply some medicines topically. You dermatologist will prescribe both the medicines if you wish so. Once you have finished the dose of antibiotics prescribed by the dermatologist, you can still continue with the topical medication. The tips given above help you to reduce the number of zits and pimples on your chin and also prevent the occurrence of permanent scars on the skin. So try to control the acne as soon as they appear and do not wait for it to cause ugly scars on your face.